As we round the bend to 2018, we revisit the ‘Seven Strategic Priorities’ from Aon’s 2018 Talent Acquisition Study to drive digital transformation in Talent Acquisition. A company’s ability to stay competitive and lead through the ongoing business transformation increasingly depends on its finesse to manage workforce strategically. Talent Acquisition (TA) today is a strategic function and takes up a lot of time of the vital duo - the CEO & the CHRO in any organization. With the changing business needs, and working ecosystem TA is increasingly shifting away from its unstructured and traditional practices to a more mature function. Aon’s 2019 Talent Acquisition Study Asia Pacific and the Middle East seeks to deliver insights on talent priorities, candidate experience, employer branding, metrics and impact, and new-age imperatives for the Talent Acquisition practices of organizations across the Asia Pacific and the Middle East. With the rise of digital jobs, new roles and capabilities are emerging. Functions ranging from marketing to manufacturing are demanding technology as well as business skills. The 2018 study suggested critical thinking, results orientation, innovation, and creativity were the most valued skills. While the organizations identified the skills to drive the digital agenda, the assessment tools to identify these skills remained subjective. The future critical skills and traits identified are assessable using psychometric, behavioral and technical tests; however less than 1/3rd of the talented professionals are currently using such tech-enabled tools. Expert Advice: Create Success Profile for every critical role in the organization. Over and above comprehensive job description, this profile should articulate critical skills and traits that have been observed in high performers. The Aon 2018 Talent Acquisition Study found employer branding was one of the top three strategic priorities for TA professionals. More and more organizations recognize the need to develop and promote their employer brand. 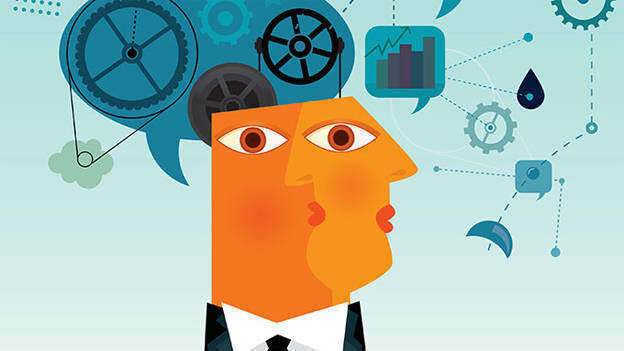 Professionals identify employer brand as the organization’s reputation and the distinctive strengths that organization projects to the outside world. However, the study found that only 38 percent of organizations measure the ROI of their employer branding initiatives. Expert Advice: It was found that organizations who leverage Assessment technology and focus on measurable outcomes in conjunction with branding efforts can improve perceived brand impact by over 8 percent to 19 percent. The metrics to measure ROI can include Cost per hire, Early attrition rate, Number of applicants, New hire engagement, Time to hire, etc. According to the study, the most cost-effective channels for potential sourcing job candidates were employee referrals, online job portals, and the organization’s own careers webpage. The participants claimed that the sourcing channels which currently provide the highest quality of talent are employee referrals, recruitment consultants and online job portals. However, only 50 percent of the participants said that they were satisfied with their talent acquisition technology. Expert Advice: Decide the metrics your business wants to measure and lay the foundation to collate data for measuring improvements. The study noted that 80 percent of talent professionals recognized the need to provide a positive candidate experience throughout their recruitment process. Yet, only 43 percent of organizations do not capture candidate feedback after the selection stage. Additionally, 39 percent only capture feedback from candidates who are hired and only 18 percent attempt to capture feedback from every candidate. Expert Advice: As part of a superior candidate experience, your assessments should be short, visually-appealing, objective, job-relevant and indicative of the everyday situations that individuals will experience. For example, Gamified assessment takes the science of psychometric tests and applies gaming elements to make the tests more engaging and more attractive to test takers and offer greater information to test users. Time to Hire, cloud-based technologies today can address key metrics such as Quality and Cost of Hire. Selection and Assessment platforms assist in simultaneous reach-out to a broader audience, as well as leverage behavioral science and psychology to shortlist culture-fit candidates. Despite such technological advancements, only 16 percent of Indian surveyed organizations are currently using technology-based assessments, against a global benchmark of 52 percent. Expert Advice: Different assessment tools will predict different behaviors and skills. It is essential to always use validated assessment tests, not just popular online tools. Ultimately, your choice of which specific assessments to use will depend on the specific abilities and competencies you require. 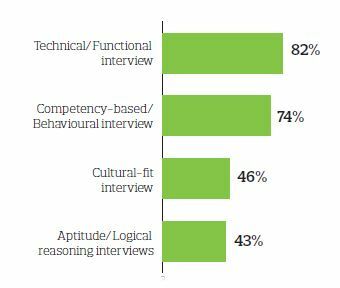 The key challenge with interviewing is to assess candidates accurately, quickly and cost-effectively. This demands a structured and consistent interviewing process. Despite technology advancements, virtual and in-person interviews continue to be the preferred modes of final selection. 97 percent of organizations shared that they conduct face-to-face interviews when recruiting; 59 percent conduct interviews via video conference. Expert Advice: In addition to verifying a candidate’s technical and cognitive ability, leverage tools that are effective in validating his/her behavior and suitability. Overall, your endeavor should be to create a consistent interview process. Video interviewing technology hence is the future to making your hiring processes more efficient and effective. Apart from providing a great candidate experience, it reduces the number of no-shows, review candidates in assessor’s own time, saves time and cost, etc. Talent Acquisition is no stranger to data and metrics. Technology platforms ranging from ATS to Referral tools and Career Pages to Assessments provide rich inputs. Until now it has been a common practice for TA to focus on reporting and summarized metrics on the efficiency of the recruiting process. However, this is no longer sufficient in today’s business. 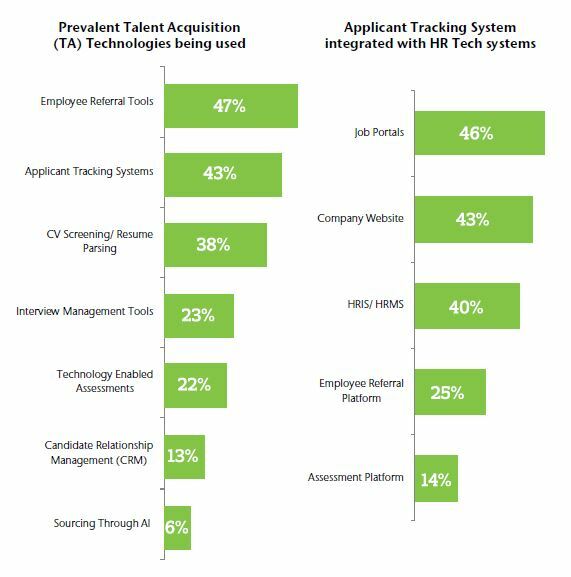 Integrating ATS and other recruiting platforms can help utilize candidate data in ways that were not possible before. The study found that with a primary focus on efficiency and cost/time to hire, 50 percent of large employers in the Asia Pacific and the Middle East have integrated their internal systems. Expert Advice: Technology-based assessments can help you to find the optimum person-job match. Importantly, they also enable you to build and fine-tune predictive talent analytics algorithms. These can help you to adjust your talent strategy to suit the changing dynamics and opportunities in your market. Improving your ability to make fair and objective data-driven talent decisions will help you to differentiate your employer brand and recruit the right people. It will also enable you to manage and develop your staff more effectively, enhance employee engagement and boost retention. Spot the top trends in TA by participating in Aon’s 2019 Talent Acquisition Study Asia Pacific and Middle East. The survey is your opportunity to share your perspective as a member of the Talent Acquisition community.